One of the best ways to enjoy having a deck is grilling outside. However, without the proper care and maintenance, your grill can have disastrous effects on your deck. You need a grill mat for a deck! Unsightly grease, sauce stains, and the possibility of escaping embers causing burn marks on an otherwise pristine and elegant deck are otherwise likely. You may think it’s an unnecessary accessory, but your deck will thank you for it. Whether you have a wooden deck or a composite deck, there are many different varieties available on the market. 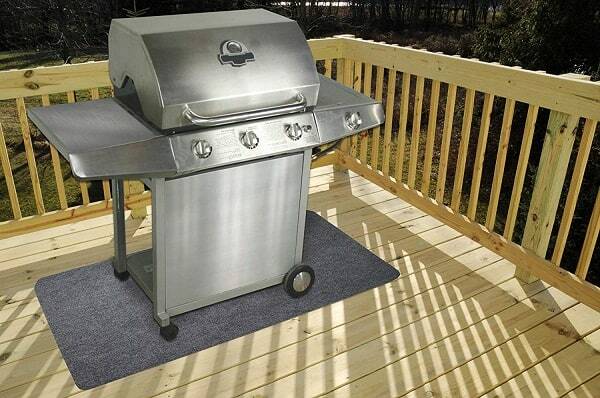 It may be difficult to decide the best grill mat for a deck. We have compiled the ones that we believe provide the best protection for your flooring. 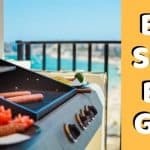 1 What is a Deck Mat for BBQ Grills? 3 Are Grill Mats for Decking just Splatter Resistant or Heat Resistant and Fireproof? What is a Deck Mat for BBQ Grills? If you want to maintain the cleanliness of your grilling space and also lengthen the life of your deck, a deck mat (or grill mat) is a must-have. 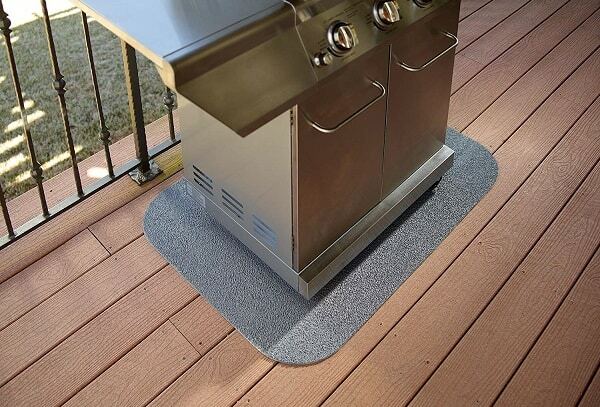 A deck grill mat acts as a protective layer between your grill and the deck. It prevents grease, sauce, or any other splattering liquids from causing damage to the flooring. You may be considering the quick and cheap fix of putting a folded tarp under your grill. But after just a few grilling sessions, you will see why that doesn’t work. You will likely ruin the tarp and be stuck standing in meat grease. A grill mat made for use on the deck not only looks more professional, but it also protects better. There are two types of grill mats. The first will trap the grease inside its absorbent layers of material. The second type uses a repellant material which causes the grease to sit on top of the mat to be cleaned up later. You can feel good knowing that the GrillTex Under the Grill Protective Deck and Patio Mat is made from 100% recycled rubber. That synthetic rubber gives it an incredible heat resistance of up to 500 degrees Fahrenheit! The protective barrier collects your spills and splatters and is easy to clean just by spraying off with your garden hose. GrillTex Mats come in a variety of sizes, all of which are relatively low-cost. 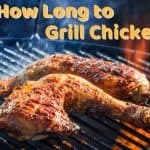 It is impressive that at such an affordable price, GrillTex also offers a one-year limited warranty. To ensure that you get a mat large enough to fit your needs, measure your grill and allow for an additional 2-3 inches on every side. This should allow for an adequate “spill zone”, but you can always go larger if you like. GrillTex Mats are a great fit for most decks. However, if your deck is composite, you should be aware that some consumers have reported discoloration to their composite decks when using this brand of mat. This is a common complaint with mats that use a rubber based backing. If you are looking for something more round, the Newtex FirePad Deck Protector is available in sizes of 24 and 36 inches. 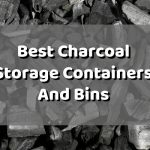 It is a good fit for small grills, firepits, and smokers. It is also safe on stone, wood, and composite decks. This protective deck pad is made using the same technology that military equipment and aircraft use to protect against heat and fire. 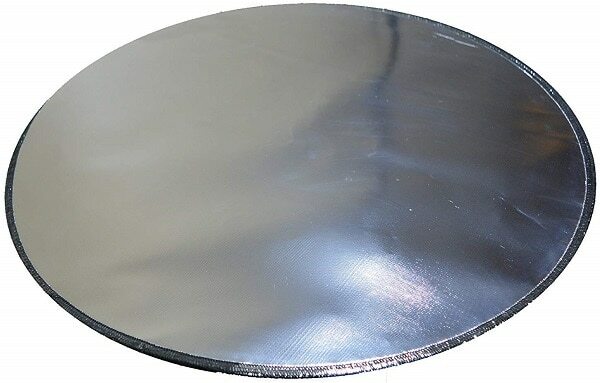 The reflective, silver surface means that heat doesn’t get through, nor is there any absorption. The mat itself stays cool because the surface reflects heat. For best use, this pad should be stored indoors when not in use. Also, be sure the pad is clean and dry before each use. It is a flexible pad and rolls up in the included protective sleeve for easy storage. 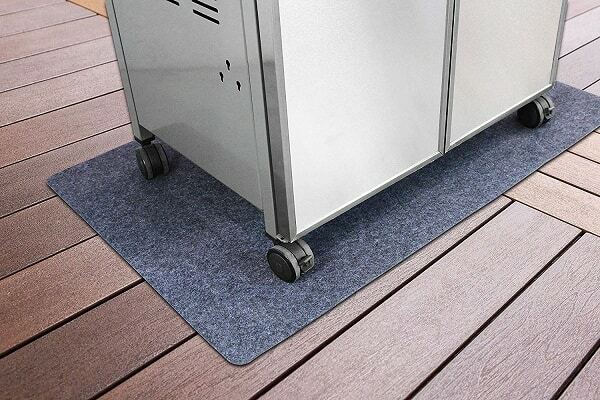 Both environmentally friendly and budget-friendly, the Montana Grilling Gear Floor Mat is a real crowd pleaser. It is made from PVC free fabric blends that effectively absorbs the liquid from spills and splatters. This keeps your deck safe from slippery oil and other stains. The non-leak backing protects all types of decks from oil or grease that may penetrate thinner mats. This mat can easily be hand washed with soap and water or hosed off using a garden hose for a quick rinse. It is only available in one size, which measures 30 x 48 and fits most standard size grills. This mat does well in areas with light rainfall. However, if you experience heavier rainfall in your area, you may experience some discoloration to your deck. Montana Grills are also known for their great customer service. So if you find that this isn’t the right grill mat for you, Montana Grills is happy to assist you directly. This mat is also not suitable for use with charcoal grills. Small but mighty, the commercial grill mats from Napoleon Grills are a definite contender. 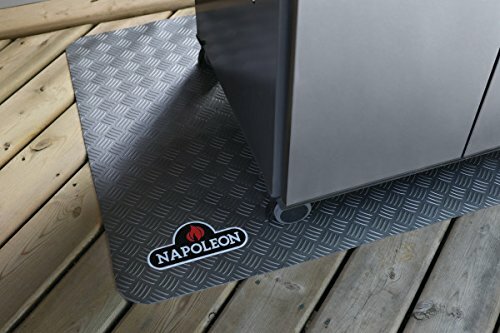 Perfect for charcoal grills, the Napoleon Grill Mat is fire resistant. It has a silver, diamond-plate pattern which is more stylish than other grey or black mats. This is a heavy duty mat that repels all liquids and stray embers. It is easy to clean with a quick rinse from your garden hose. It stands up well against extreme heat and weather conditions. Measuring 47 x 32, it can fit many standard size grills and works especially well for smaller grills. The higher price point is well worth it thanks to the high-quality craftsmanship that prevents any punctures or penetration of the mat. As one of the few larger size mats that won’t cost you an arm and a leg, the Drymate Grill Mat is an absorbent mat that easily contains all messes – oil, grease, and food bits alike! This large mat measures 30 x 58 and is ¼ inch thick. The backing won’t slip or skid, staying in place and protecting your deck from spills. The grill pad material is strong, durable, and made from 100% recycled plastic bottles. So it is also eco-friendly! It is flexible and easy to clean. Simply hose off, power wash, or hand clean with soap and water. Drymate Grill Mats are made in the USA, and they are BPA and Phthalate Free. One thing to keep in mind is that this grill mat does not possess flame resistant properties. Do not use with charcoal grills or fire pits. It also does not do well in areas with heavy rainfall and could cause discoloration when exposed to large amounts of moisture. Known for its heavy-duty absorbency, the Splatter Mat has made a name for itself in the world of deck protection. It is safe for use on all wood, brick, stone, slate, cement, and composite surfaces. It also comes with a low price tag and impressive bragging rights. This mat can hold five times its weight in liquids! 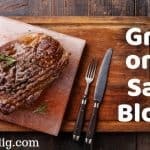 What sets the Splatter Mat apart from other grill mats? The non-woven surface areas prevent bonding or adhering to composite decking, unlike some similar mats also made from 100% recycled plastics. The Splatter Mat steers clear of rubber backing that could potentially harm composite decks. 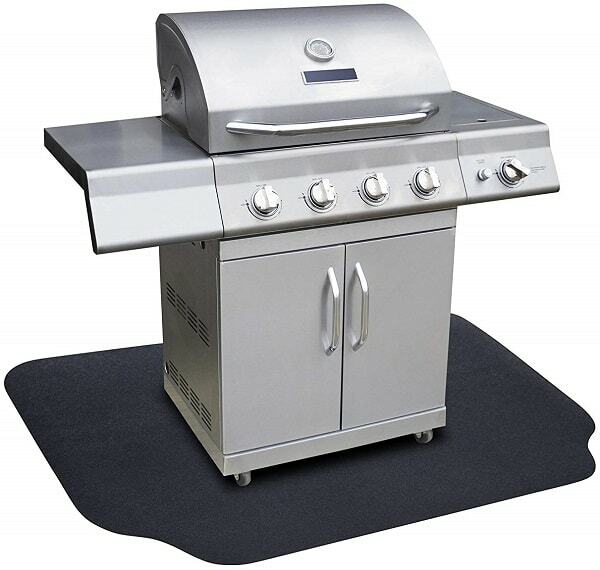 The mat is available in two sizes, either 48 or 60 inches, accommodating both small and large grills. The developers of the Splatter Mat do warn that if exposed to heavy rainfall or other moisture, remove the mat and allow it to dry fully to prevent water marks on your deck. 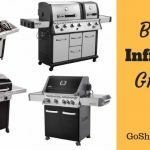 It is also not designed for exposure to extreme heats for extended periods of time and is best used with gas grills only. It is easy to clean with a little soap and water, a gentle spray down, and then let hang to dry. If you are looking for a grill pad that really sets itself apart from the rest, try the one, the only, The Original Grill Pad. Unlike its plastic and rubber counterparts, the Original Grill Pad is made from fiber cement. It is heavy duty, heat resistant, and weather resistant. The flexible, lightweight pad is safe for use with any surface, including composite decking. Designed for use with both charcoal and gas grills, it is also suitable for a fryer, smoker, or other outdoor appliances. It is available in a variety of shapes, such as rectangle, round, and oval. The Original Grill Pad also comes in a variety of different colors to perfectly match your deck or patio. It does not contain rubber backing, and is therefore safe for use on composite decks. Trapping spills and splatters on top of the mat, not absorbing them, makes the Original Grill Pad easy to clean with mild soap and water. The Original Grill Pad will last for years with the proper care and maintenance. It comes with a higher price tag, but is a great value based on its longevity, durability, and high-quality craftsmanship. Just like the names suggests, the Tuffy Outdoor BBQ Decking Grill Mat is tough on spills and splatters from your grill. It boasts an impressive reputation, being manufactured and assembled in American factories by American workers. Their mats are environmentally sustainable and made from 100% recycled tires, keeping junked tires out of our landfills. The Tuffy grill mat has passed rigorous fire safety tests, making it great for use with gas grills, charcoal grills, smokers, and all other outdoor cooking products. However, do not use this mat underneath a fire pit. While not completely fireproof, it is suitable for use with temperatures up to 550 degrees Fahrenheit. It has other versatile uses outside of the cooking spectrum as well, such as for use with ATVs, motorcycles, RVs, and camping equipment. Tuffy mats are reversible to a ribbed side that can make a great mat for cleaning off your shoes before entering your camper or RV. The mat is resistant to liquids, sauces, and other stains. You can clean it simply with soap and water. They can be on the higher end of the price scale but are made to last a lifetime. To properly maintain your Tuffy grill mat, Tuffy recommends that you move it occasionally and expose all sides to sunlight. The ribbed bottom of the mat actually helps to prevent mold and mildew. A word of caution – Tuffy notes that the mat will have a strong rubber smell when you first open the box. This will dissipate within a few days after opening an allowing the mat to air out. 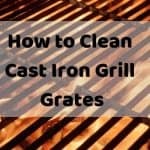 Are Grill Mats for Decking just Splatter Resistant or Heat Resistant and Fireproof? Not all grill mats are equal. Some exist specifically to be splatter guards. However, other grill mats can be both splatter resistant and heat resistant. None of the grill mats are 100% fireproof, but we did try to make a designation between those mats that are meant for spills and splatters only and those that can protect against stray embers. 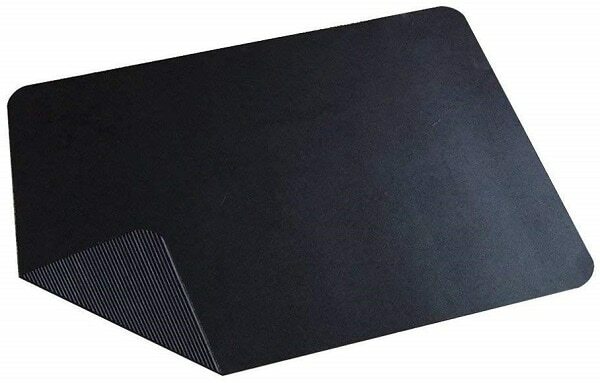 The grill mats above which are safe for use with both gas and charcoal grills are the ones we have found to be both splatter resistant and heat resistant. 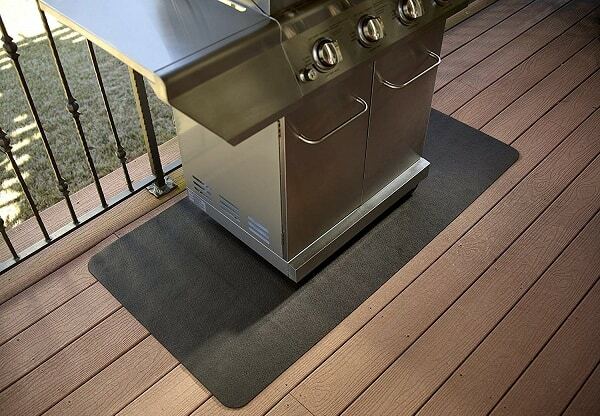 Gas grill only mats prevent stains and damage from oils, grease, and other spills. Some mats may be advertised as heat resistant, but it does not mean they are safe for use with charcoal grills. Always check the recommended usage for each mat you consider. Grill mats can go a long way in preventing costly deck or patio repairs. It is a small purchase that will save you plenty of headaches down the line. You have put time and money into the upkeep of your deck or patio, so consider a grill mat an investment in its future. 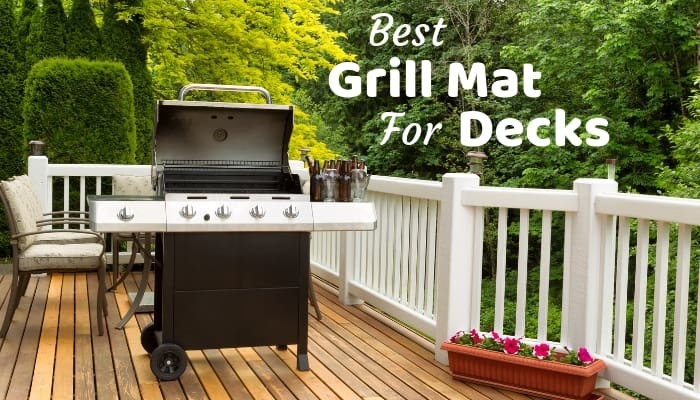 We hope our list of the best grill mats for a deck or patio has helped you narrow down the options that best meet your needs. Every grilling enthusiast should have a grill mat to keep your flooring pristine and protected while you serve up your sizzling favorites!